1953, 1954, 1955 Coin necklace. The Wren Farthing-Coinwear. 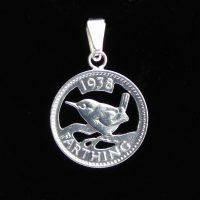 Silver plated Wren Farthing coin necklace available on this page in 1953, 1954 and 1955.